Corporate travel insurance is an insurance that is meant to cover medical expenses and others losses incurred while doing business travel. Corporate travel insurance includes an extensive range of benefits for various events such as trip cancellation, loss of baggage, evacuation due to medical conditions and others. The corporate travel insurance market is showcased to witness a robust growth during the forecast period 2017-2024. The market is anticipated to flourish at a CAGR of 8.6% over the forecast period. Increase in business travels is expected to foster the growth of corporate travel insurance market across the globe. Geographically, Europe region accounts for the largest market share in global corporate travel insurance market followed by Asia-Pacific. Asia-pacific is anticipated to maintain second position over the forecast period. The major countries witnessing the increased demand for corporate travel insurance include China, Korea and Japan. 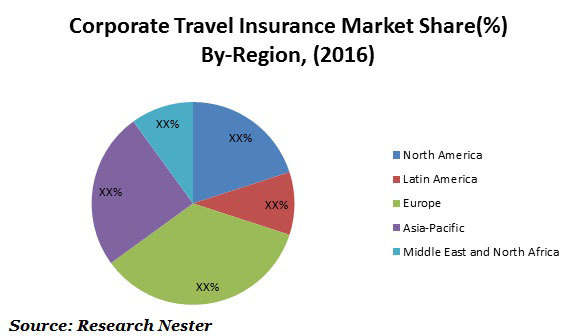 North America region is also witnessing a positive corporate travel insurance growth and is expected to witness the significant growth over the forecast period. Further, in North America, enhanced travel options and advanced technological access have made business traveler’s access to insurance companies easier, thereby escalating the adoption rate of corporate travel insurance. Increase in expansion of business across the globe coupled with rising business travelers is anticipated to foster the demand for corporate travel insurance. Further, rising awareness among business travelers is anticipated to be the dynamic factor behind the rapid growth of corporate travel insurance market. Also, government regulation of several countries have made travel insurance mandatory, which is envisioned to bolster the growth of corporate travel insurance market. However, lack of awareness about insurance policies is believed to dampen the growth of corporate travel insurance market. Moreover, this can be attributed to various factors such as low percentage level of economic development of countries, extent of saving in financials and the reach of insurance sector.